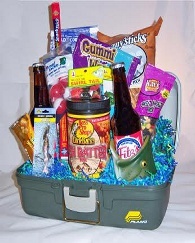 This tackle box is the perfect catch for your favorite fisherman. Includes the following. Tacklebox, a bag of pretzles, fishing snack mix, bag of cookies,2 bottles of soda of your choice, gummie worms, beef jerky, fish can cooler, peanuts, a container of Bass Pro Shops fish batter mix and misc. fishing lures and hooks. * We reserve the right to make substitutions when items are out of stock. Substituted items will be of equal or greater value.